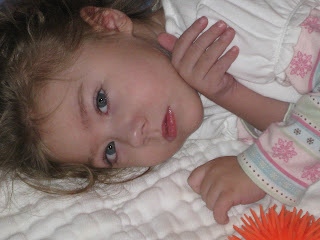 After a great night's sleep (without any sleep or pain medication) Reagan woke up this morning miserable yet again. Very tense, crying, throwing up...the works! I wasn't sure what to do. I called and spoke to the doctor on call who didn't really think it was necessary to bring her in but she did prescribe a different antibiotic, Augmentin. This is antibiotic #3 of this go round. Hopefully this one will do the trick. Problem is, we don't necessarily know that whatever is bothering her is bacterial. We just assumed it was yet another strep infection (apparently the throat culture results are not back yet). She was beyond miserable this morning but her mood improved as the day went on. Don't get me wrong, she was still very sick, all around groggy taking multiple naps and throwing up several times, but that was still improvement compared to the morning. What I hate to see again is the vomiting. Even though she's not throwing up large volumes anymore because of the gj-tube, she still holds her breath and turns purple when it happens. I guess it's good that she holds her breath though, because aspiration is always a concern with stuff coming back up. We have had a dry spell for a while and I was hoping things were getting better in that department. I wonder if it's at all related to the antibiotics she's been taking. I know they can make you sick to your stomach. Who knows. I sure wish she could tell us or at least signal to us what it is that's hurting her. She continues to rub at her face and do this weird squinting thing with her eyes. I'm thinking we may stop by the ophthalmologist's on Monday just to have someone check her eyes out to make sure everything is OK with her lens implants. This girl...always has us guessing. Please continue to keep her in your prayers, she obviously still has a long way to go to get back to her normal happy healthy self. Today was definitely an answer to prayers. Even though Reagan continued to be miserable last night and didn't sleep well (and threw up both last night and this morning)...she is in a much much better mood today. I knew when I saw her smiling again we were in for a better day. And she's been great...all day long. She must feel better, because it really is like night and day. I don't know if the antibiotic finally kicked in or if her g-tube site is less irritated (even though it still looks pretty yuck)...but whatever it is, it's an answer to prayers. I decided to NOT take her back into the pediatrician's office for bloodwork (and potentially expose her to more germs) so we just spent the day at home. She did have vision therapy and her therapist was very impressed at how attentive she was today. She's been so super sweet today...nearly every time I pick her up she gives me the sweetest giggle. SO nice. Music to my ears. Thank you so much for your prayers and please continue to lift her up as she fights to beat the sickies that have been plaguing her for the last two months! Reagan is still miserable. Completely and totally miserable. I don't know what to do for her. She isn't comforted by anything. When she's awake, she's in pain and she lets you know it. Moaning and groaning, kicking and screaming and crying all day long. If it's strep or a UTI...she's already taking antibiotics, so she should be covered against either of those (or at least getting better at this point). If it's the granulation tissue around her gj-tube...I've been putting the triamcinolone cream on it...I don't know what else to do (I asked her pediatrician today for 0.5% cream to try because the 0.1% isn't working). She's still not sleeping well. It's a grueling process to get her to sleep sometime after midnight and then she still woke at 4am and at 6am. We tried the Ativan last night...it didn't work. At the suggestion of another mother, we asked to try Clonidine tonight. I just gave it to her and I have my fingers crossed. We need something to ease her pain and allow her to rest. We're getting desperate here. It's ridiculous that she should have to suffer like this. If she isn't improved by morning, I plan on taking her back into the pediatrician's office (she's out on Fridays) and demanding some lab work. We've GOT to figure this out! Lots of prayers needed for our little one. Lots. Last night was a nightmare trying to get Reagan to sleep. The movements really picked up last night and she was fighting sleep big time. I tried her in her bed. That was a no go. Finally I gave up and just held her til she fell asleep...but every time I'd get up to lay her down, she'd wake back up. Ugh! This happened maybe 4-5 times before I finally got her down for the night at 1am. I was so frustrated. Today she woke up less cranky but with definite signs that she's getting sick. Lots of erratic movements, nonstop tension throughout her body, teeth grinding, coughing and choking as if she has a sore throat...not good. She's also got some granulation tissue that started popping up around her gj-tube yesterday. I'm sure that's not helping matters. This morning we had her follow-up appt with the mitochondrial doctor. Not much of an appt. We sat in a crowded waiting room for what seemed like forever and then when we finally saw the doctor, she was in and out like a flash. Still not impressed. Maybe my expectations were too high. Only one of the genetic tests she had ordered from our previous visit (over a month ago) was in...Hexamidase A & B (Tay Sachs Disease)...it was negative. So that's a good thing. 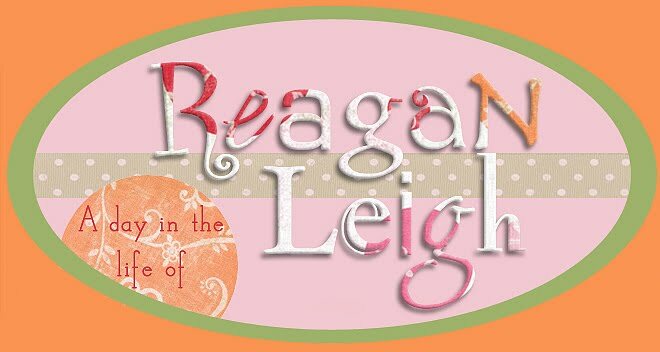 She mentioned that based on the fact that Reagan has had a recurrent strep infection, she would like her to see an immunologist. Problem is, first appt available is June 23rd. She also thinks we should postpone Reagan's scheduled dental work (March 16th) because strep getting into her bloodstream could cause some major problems. I hate to postpone this again (our original date was supposed to be on Dec 30th and I know they are booking now for summer), I just hope her teeth can hang on until then. On a good note, now we should be able to have her birthday party on her actual birthday (I was thinking we'd need to have it the weekend before because I didn't know how she'd be feeling after all of that). So she sent us on our way with lab orders and we headed over to Reagan's pediatrician's office (in the adjoining building). There she took a swab of Reagan's throat (for culture) and she gave us an antibiotic to start her back on. We're going to use it for 5 days and then try to switch her over to amoxicillin for a month or so. I hope this does the trick this time. Lots of prayers needed in this area! Reagan has GOT to beat this strep! She added another test to the blood work and we went upstairs to the lab. Reagan had 7 tubes of blood taken for various tests and she was such a trouper. She was a little more squirmy than usual, I think because of the chorea more than anything, but we did get all 7 tubes. As we left there we met up with another mother whose child has mitochondrial disorder. Missy, Samuel's mom, saw on the blog that we were going to be next door and she came over to meet us. We've spoken on the phone several times before but never met in person, so that was nice. Samuel is still in patient after his MRI last week. Poor things. I know they SO want to just go home. Please keep them in your prayers as well. What a yuck of a day. Reagan's mood has been on the foul side today. She did not want to go to sleep last night. She laid in bed restless and fussing. I was up with her til 1am or so and finally got her to fall asleep on my shoulder. She did sleep in til 9:45 or so (same as yesterday), so that was a plus. But I knew it was going to be a bad day when I woke up this morning and our helper was no where to be found. She called in sick...well she actually sent me an email that I didn't see until and hour and a half after she was supposed to be here. Reagan's been fussy and on edge all day. Outbursts of crying, outbursts of laughing. More movements too. She's been grabbing at her face, rubbing it with the back of her hand and scratching herself with those little razor sharp fingernails. Not sure what that's about. I wouldn't be surprised to find out she's got an ear infection brewing. But at the root of the problem I think we'll find another strep infection (or the same strep infection). She's got an appt to see the mitochondrial specialist tomorrow and we're going to talk all of this over with her. She may need to see an immunologist or an infectious disease doctor to figure out why she's been unable to kick these infections. Then we're going to run by the pediatrician's for some blood work. She thinks we might be dealing with rheumatic fever. I've been wondering about this for quite sometime because rheumatic fever can follow strep infection and one of the main symptoms is chorea. I just want to get to the bottom of all of this. Why does Reagan keep getting sick? What can we do to get her well? Somebody needs to figure this out and ASAP! Lots of prayers still needed! Reagan has been a bit of a crank today. Just on edge. Can't walk away for two seconds without her fussing but she's not happy to be held either. Makes me worry a little about the fact that she's two days off her antibiotic and already acting strange. I looked back and the last time she had strep throat (and was on this exact same antibiotic) she started getting sick only 3 days after finishing her antibiotic. Ugh. I sure hope that's not it, but you can bet I'm going to keep my eyes open. Another thing that makes me worry...movement. Lots of it. She was kicking and squirming all over the place today. Arms too. Maybe chorea...but I sure hope not. Another sign of impending strep. I don't know what this mood means for sleep tonight. Doesn't look good. She's also been having a horrible time managing her spit today. Lots of choking and she threw up a few times because of it. She did manage four wet diapers today all on her own (without the help of Lasix), so that was a good thing. And despite the cranks we did get some laughs out of her. Love those laughs. Prayers for some rest and healing for my little one. No more sickies!!!!! 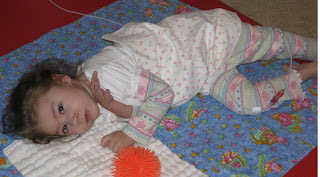 Reagan slept well last night but in the wee hours of the morning started crying out in her sleep. She'd cry out, I'd jump out of bed and rush to her crib, and there she'd be fast asleep hadn't moved an inch. She did this quite a few times...finally I just started looking at the monitor and sure enough she was doing it in her sleep. Poor thing, must have been having nightmares. Despite the rocky start, she's actually been in a great mood today. Grandma came to visit, so that always makes her happy. She's been very spitty today and not managing it well. She's letting it just pool up in her mouth and then she starts choking on it. She did have a throw up incident tonight, but it's hard to tell if it was because of the spit or if it was the Gas X I had just put in her tummy. Some of it did come up. She's still not having regular wet diapers. I'm not sure if it's a side effect from the Tamiflu or what...I just want her to start going again on her own. Today her tummy was getting super distended...I had a hunch that she might need to have a dirty diaper. So tonight we gave an enema a try and sure enough...problem solved. Her bloated little belly went back down and she must feel loads better. Hopefully she'll be able to get a good night's sleep now. 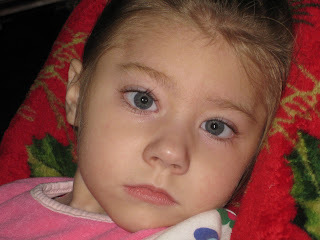 Please continue to keep her in your prayers...she still needs to kick this virus (and strep) for good!!! No more fevers today...so that's a good thing. Reagan slept from 10:30 last night til 6am this morning, so that was a good thing too. I think maybe the Tamiflu has helped her. She does seem less sicky today. She's still a little off, but we did get more smiles and laughs out of her today than we did yesterday. This morning we had her transition meeting with the school system. We're obviously not going to send her to school right now, considering her health issues and developmental status, we'll do homebound schooling for now. They called yesterday to confirm and I told them how sick we were, so instead of canceling it (so close to her 3rd birthday) they decided to come to us. So at 8:45am this morning we had about 10 different people pile in to our house. I forewarned everyone that we were sick, so hopefully they all held their breath while here. I'm definitely feeling worse today. It's mainly upper respiratory. I have a nasty dry cough. Scratchy throat. Headache. Some hot and cold sweats. Not good. I hope I get over it quick. I can't take a sick day. I'm just glad that Reagan seems to be feeling a little better. Hopefully she can get and stay well with our sicknesses lingering in the house. Today she continued to have bladder issues. Not one wet diaper all day (or all night). She had that one at 7pm last night and that was it! I started to worry this afternoon when her tummy started looking distended. At 5pm I gave her a dose of Lasix...and nothing. Finally at 6:15 she had a wet diaper. Not a huge one though. Then about 30 min later I was holding her on my lap and I felt a warm rush. I picked her up and ran across the room to her mat with pee dripping down my leg and onto the floor! Yes it was gross, but I was happy she was able to go again. She could still use another couple wet diapers. Please keep this in your prayers. We really need her to start going on her own again. This is something that can land us back in the ER and the ER is the last place we need to be going right now! Prayers for quick healing and for pee! Another rough one last night. Reagan woke at 2 and at 4 both times fussing but both times she seemed pretty cool (so cool I didn't feel the need to take her temp). I put her in bed with us and she quickly fell asleep. About 30min to an hour later she started fussing again. I picked her up and immediately realized that she was on FIRE! I checked her temp and she was at 105!!! I ran for the tylenol and we started wiping her with cool washcloths. We kept checking her temp (rectally) every 15-20 min and it was on the decline. Thank God for tylenol! It never really went all the way down. It's still hovering at 100 but I'll take 100 over 105 any day. She threw up a couple times...not sure if that was because of the fever or if she just has a tickle in her throat (like I do, ugh oh). She did cough up some nice green phlegm. I put a call in to the pediatrician and although she still doesn't "think" it's the flu, she's not willing to take any chances. She called in a new prescription for Tamiflu (the stuff we had in the fridge was expired and all crystallized) so we started her on it before noon. As far as the fever goes...we're just going to do Tylenol around the clock...every 4 hrs. She also went all day long without a wet diaper. She seems to do this a lot when she gets sick. Finally around 7pm she had a big giant one. Most of the day you could just tell she did not feel well. No smiles...very sleepy. But as the day wore on I did get a few smiles. She was really kicking her legs around. Still keeping the right one bent most of the time, but she's moving both of them (and it seems to be more of a purposeful kicking than the typical chorea movements). The doctor said her x-ray came back fine. Thank goodness. So it's probably just a pulled muscle or tendon. 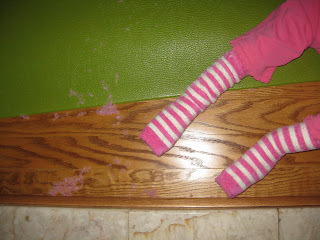 I looked back in the blog and at the beginning of October she was having the same problem with her left leg. So hopefully it will just correct itself. Hoping and praying for some improvement and rest over the next few days! Reagan didn't sleep all that well last night. She woke up at 4am crying, had lots of gas and a wet diaper, then finally went back to sleep. Too bad she was up again only 2 hrs later. She seemed happy enough when I left at 7am for my doctors appt. The doctor suspects I have a sinus infection and put me on a 5 day antibiotic (which will take care of strep as well). While I was gone Reagan had another throw up incident and then she fell asleep. We let her sleep right until we had to leave for the medical center. As I loaded her into the car she felt hot to me. I took her temperature...102! I gave her some tylenol and then we headed on our way. First stop, the pediatrician's office. She checked out her leg (and wrote up orders for an x-ray), checked her ears, swabbed her throat for strep, and swabbed her nose for the flu. Both tests came back negative. Then it was off to Diagnostic Imaging where we had an hour+ wait. She was as good as gold but you could just tell she did not feel well. Her face was flush, she was very spitty and not managing it well. They did an x-ray on both hips and then we picked up a quick lunch. From there we headed over to Urology. No she's not having any bladder issues at the moment, but it seems these incidents come and go so we thought better safe than sorry. As we were waiting Reagan's fever started to soar once more so we waited until a full 4hrs and gave her some more tylenol. The doctor was very nice, looked Reagan over and told me about two tests she wanted to order. I don't remember the names of either but we'll be going in for those sometime soon. Meanwhile my little one was getting sicker and sicker. I hate to say it but I'm afraid we might be dealing with the F word. Could it be that Mike has the Flu and has now passed it on to Reagan?!?!? Ugh. I sure hope not. The thing is, he's been on antibiotics for two days now and doesn't seem to be feeling any better. And now that I think about it, his symptoms do seem spot on with the Flu! Yuck, yuck. I hope that's not it. We'll have to reevaluate the situation tomorrow and then decide on whether or not Reagan needs to start taking Tamiflu. She sure needs some good quality sleep tonight (although I can hear her gurgly breathing over the monitor). Please say some prayers for my little one. Reagan has been a darling today. Still having leg "issues" but she doesn't seem to care. I spoke to the pediatrician today and we'll probably go in tomorrow for an x-ray. I'm thinking she just pulled something, but she wants to check it out just in case. I hate the idea of going back into the pediatrician's office (oh so germy) but at least she's still taking her antibiotic so hopefully she'll be protected. Mike went in this morning to the doctor and was given some antibiotics of his own. I'm actually going in tomorrow morning just to get checked out because I'm feeling a little tightness in my chest and I sure don't want to be pass anything back to either one of them. Reagan has been so precious today. Lots of cooing and giggling. Every time I would pick her up she'd start laughing. I LOVE it when she's like this. I just want to squeeze her she's so cute! It's times like these that I really need to get on film for everyone to enjoy. I've been bad about even taking pictures lately. It's so easy...I really have no excuse. I am really excited about something we have in the works right now. We're finally going to get some professional pictures taken of Reagan. This has been in the works for over a year and now it looks like it's actually going to happen. It's through a program called the littlest heroes project and we've had two photographers commit and then bail out on us. But it looks like the third photographer is the charm...I think we've finally found someone committed to doing this and doing it right. Her name is Erin Golan and she lives close by and seems to be as excited about doing this as we are. We set the date for the second week of March and I'm SO excited about finally getting some great pics of my sweet girl. Now all we need is little miss Reagan to cooperate. Today's mood on photo day would be a great start! Reagan woke again this morning all smiles and giggles. Love that. I just love that she's feeling better and finally has it in her to smile and laugh again. With her feeling better we headed on in for therapy today. OT first...her OT had to wake her because she was fast asleep. And boy did she wake her, she had her on her tummy (on the ball) nearly the whole time. I was living in fear we were going to have a major throw up incident...but all went well. She also did some swinging and rolling, so I think we covered just about everything that could possibly make her nauseous. Then she had feeding. She did some really good chewing on gummy bears and some good crunching bites of veggie straws. She was very tolerant of everything and her therapist used some techniques to help relax her jaw to try to stop her from grinding those teeth. At home we attempted the stander and it was a no go. We noticed this Friday as well, when you try to put her in it, she starts fussing. We've figured out it has something to do with her right leg. She's keeping it bent (and kind of turned outward at the hip) at all times. She'll move it, she just won't straighten it. I don't know if she pulled something or what...but if you try to straighten out that leg, you get one unhappy girl. Now that we've made that connection...it's pretty obvious...it's always in the same position. Ugh. This girl just can't catch a break! Speaking of, Mike is still really sick. I managed to get a doctor's appt for him tomorrow morning, so hopefully he makes it til then. If he keeps tossing and turning like he did last night, I might have to take matters into my own hands! Please continue to keep both of my kiddos in your prayers! Not much of a Valentine's Day here in the sicky sick household. Reagan's still a little under the weather today. Although she did wake up this morning with giggles! Today was the first time we've heard laughter out of her in over a week! You can tell she's still not feeling great though. She's awake, then she's asleep. Awake, asleep. I wonder how often she does this at night. She also had two throw up incidents today. Both times it was a good amount of clear fluid. Ugh. More throw up? I thought we were over that. And now...Mike's sick too. He's got a fever, chills, body aches. Now I've got two sick kids on my hands! I'm hoping it's strep throat and not some other germ lurking amongst us. I'm not sure if I'll be able to convince him to go in to the doctor, but if he continues to get worse it might not too hard. We both should probably go in just to make sure we don't pass something back to Reagan. Poor girl. She just can't seem to stay healthy lately. Maybe it was those 3 weeks she spent in the hospital or multiple trips in to the ER. If you could please keep both my sickies in your prayers I would greatly appreciate it. We need some healthy days. All of us. Reagan has been quite the sleepy girl today. She slept well last night (thank God) and woke up smiling at 8am. I gave her all her medicines and our helper was working with her, when she called me to come see. She had Reagan sitting up in her big bumbo chair and she had fallen asleep! Poor thing. She sat in the chair asleep for about an hour until we woke her up for PT. Her therapist worked with her on rolling and sitting but the girl was tired! Then her vision therapist came, we put her in her chair and next thing we knew she was asleep again. She just kept smiling and raising her eyebrows, but she just couldn't keep those eyes open! Not one for therapy today! Oh well. The way I look at it, she needs her rest. She's had days and days of nonstop movement and pain, I'm just glad that she can finally relax and recover! Hopefully she'll be back to her happy, animated self soon. The smile is back! Reagan is definitely feeling better today but last night, well that was another story! She gave me a lot of grief. She kept waking up moaning and groaning. I'd change her diaper and put her back in bed and two minutes later she'd start up again. Moaning, groaning, and fussing...oh my! I just don't have the patience for that at 3am in the morning. Finally I think she slept an hour or two in my bed before waking for good at 6am. Of course she passed back out around 10am and slept for 2+hrs til we had to leave for her GI appt. It was basically just a follow up appt to see how she's been doing since getting the gj-tube. So far, so good. They weighed her and she's gained over a pound since last month, so that was good news. Reagan was all smiles while we were there and the GI doc seemed pretty happy to see that. She kept saying how good Reagan looked...but if she had seen her earlier in the week it would have been a whole different story. I'm just so glad to see her smiling again. She's been pretty groggy all day and even though she's still under the weather, you can just tell she's feeling better. Hopefully each day we'll see more and more improvement. Poor thing, she deserves some healthy, happy days! A phone conversation I had with a good friend today made me think. Having a child with special needs is tough. However, ONLY having a child with special needs is even tougher. I'll explain. When you have other healthy children you still have that link with society. People can still relate to you because they also have a healthy child. But when you have only one child and that child is medically fragile and "special" you lose that link to normal. People can no longer relate to you. People are afraid to talk to you (even friends that you've known for years)...for fear that they might say something stupid or offensive. It's like you and your child now have the plague. What people don't understand is that you would prefer them to say something stupid rather than saying nothing at all! It's a very isolating thing. And it's scary for us as parents too. When it's your only child...you drop everything, your entire life as you knew it, to stay home and give medicine, do therapies, and go to doctors appts every day, all day long. Even you lose touch with the "normal" world. It's tough, there's no doubt about that. And some days are tougher than others. Some days you just want to crawl under a rock and not come out. But that's a luxury that you don't have. There's medicine to be given and appointments to go to. I don't write this blog to get pity. I write it to educate. Because I know our experiences can help other families out there going through the same situation. I write it to answer that awkward question "How is Reagan doing?" and to keep a log of Reagan's daily progress. And I write it to get prayers for my little princess who I love so dearly. I sure hope that everyone realizes that. I know there are so so so so many people out there whose situations are far worse than ours. Whose children are far sicker than ours. I never want this blog to come off as woe is me because that it not at all my intention. This is our life. Just how it happens. The highs and the lows. I don't think I should have to apologize for what we go through and I don't want others to feel depressed or sorry for us. We're keeping the hope, so we would ask that you would keep the hope too! Now on to today's post. Well, I think Reagan finally got a good night's sleep last night. She didn't fall asleep until sometime between 1-2am but she did sleep in until 10:30am so that was great. Unfortunately she woke up in a lousy mood. Lots and lots of crying. I don't think the penicillin shot did anything for her! She's been miserable most of the day...now she's not only tense but crying nonstop. She took a nice long nap this afternoon but otherwise it's been a rough one today. I spoke to the pediatrician and she wanted to wait and see if things improved by tomorrow morning before trying another antibiotic. 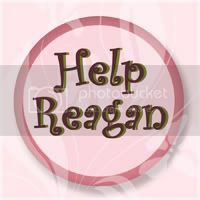 I waited until this afternoon and then called the nurse and told her it just wasn't worth waiting, I'm sick of Reagan suffering and I want to start it tonight. They went ahead and called in some Suprax (the same one she was on the last time). I gave her a dose tonight so hopefully we'll see some improvement by tomorrow! Poor girl. She needs a break. Continued prayers are appreciated! Oh what a night. Reagan did not sleep a wink last night. Not a wink. I set my alarm clock and every hour checked the monitor to see if she had finally tired herself out. Nope! Constant movement, head back and forth, arms and legs moving about. She could not stay still. She couldn't relax even for a second. We put her in bed with us and next thing we knew she was throwing up all over the place. Poor, poor girl. So first thing this morning, right after all her medicines, we loaded into the car and headed straight to the pediatrician's. The doctor wasn't even in yet, but I told the nurse my suspicions and she swabbed Reagan's throat. Sure enough. Strep...again! Ugh. This kid can't catch a break. I was suspicious that we were dealing with strep again...the crazy nonstop movements, the tension, tooth grinding, no sleeping, gaggy...I hate strep (especially for Reagan)! They went ahead and gave her the penicillin shot (that's supposed to hurt) and then gave us a prescription for a whole month of preventative antibiotics. Hey, whatever it takes. I just want this strep to go and stay away for good! Please, please keep her in your prayers. She's still having a very tough time of it...no improvement whatsoever yet. I'm praying we'll see some relief by tomorrow. Right now it's looking like it's going to be another long, rough night. Also prayers for Mike as he is leaving tomorrow for Canada...a short trip but definitely bad timing. Things here are still not good. That is, except for a very happy house full of Cajuns! Can you say...who dat? The Saints won the super bowl and I wish I could say all is right with the world. Unfortunately, Reagan is still miserable. Last night she had a horrible time sleeping. She moaned and groaned, unable to fall asleep. We put her in her bed, in our bed, back in her bed. Nothing was working. Finally I decided to try a phenegran suppository since she has also been extremely nauseous. I don't know if it helped or if she finally just couldn't stay awake. She woke early this morning, very uncomfortable and very upset. She's been super tense again all day. Her little legs quiver because she's so tense and stressed. Lots of movements, the legs and arms are going nonstop all day long (which I'm sure is part of what's interfering with sleep). I'm beyond stressed. I'm just so worried about her I can't even think straight. She's also still holding her urine. It must be related to her being sick. She goes, but only once or twice a day. Tomorrow we will definitely be headed into the pediatrician's office. It's my suspician that she either has strep throat (again) or her ear infection never resolved. I'm actually wondering if she ever totally kicked that strep throat. It really seems like it never quite went goes away and just keeps coming back every other week or so. Hopefully we'll get to the bottom of everything tomorrow. Please keep our little sick one in your prayers. She needs some relief ASAP. So...today has not been a good day. Reagan didn't sleep well last night. She tossed and turned and fought going to sleep. I woke in the middle of the night to find her thrashing about in her bed. Poor girl. She was restless. She woke this morning crying and has been on edge ever since. She is completely and totally tense. Her whole body is tense...her legs are shaking she's so tense. I think it's chorea...all day nonstop chorea. She's doing her head back and forth (so much she's knotting up her hair). She's moving her arms and legs around a lot. She's doing the crazy gaggy sort of mouth and tongue movements. Her feet are also ice cold again (that seems to go along with it). She is just not herself. Things are not right with her. It does worry me. I don't know if she's getting sick or if something else is wrong. And when she gets like this, it's like you can't do anything to calm or soothe her. You can't even really hold her. It's frustrating. She's been doing this all day long. I just hope that she's able to settle down and get some solid sleep tonight. She SO needs it. She was also retaining urine today. Not sure if it's related to everything else going on or what, but she did go all day with just two wet diapers (one about an hour after waking and another at 10pm tonight). I guess it's a good thing we're going in to the urologist on Tuesday. Please keep our little one in your prayers. Serious face...no smiles, but oh so pretty. Reagan was a little feisty today. Very vocal. Lots of babbling, noises, and laughing. She was in a good mood most of the day but tummy pains got the best of her tonight. Two dirty diapers later and she was a new girl. Now that I think about it she's been having quite a few liquidy diapers lately...two today and three yesterday. I wonder if maybe she has some sort of stomach virus. I sure hope not. Poor thing. She needs to stay healthy for a while. So today our helper was back and I managed to get out of the house for a little while. Everyone that knows me knows I never do anything for myself. It's probably been over a year since I've cut my hair and it was getting ridiculously long (to the point where I'd get headaches when I put it in a pony tail because of the weight). I've always had long hair. Usually when I go in, I just get a trim (of 4-5")...but still just a trim. Today since it had grown so much, I decided to go ahead and cut a full 10+" off so I could give it to the locks of love charity. 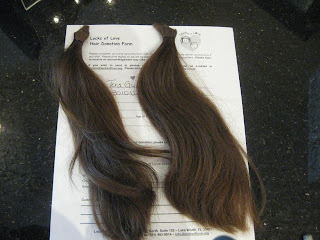 As I'm sure everyone knows, they make wigs out of donated hair for children that have lost their hair due to various medical reasons. The stylist cut it more conservatively only layering it in the front, knowing that if we had layered everything into more of a precise cut, I was going to have shockingly short hair and I might freak out! I don't know what I think of it just yet...it's definitely shorter than I've ever had it. 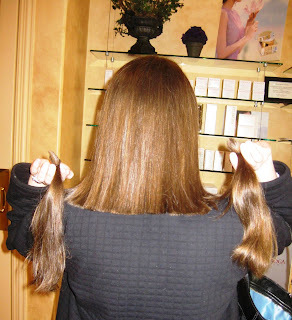 I'm just glad that I was able to cut enough off to donate to such a good cause! Reagan was difficult again last night...did not want to go to sleep. Sometimes I wonder how long she lays there til she actually falls asleep. Is it hours later? Who knows. This morning she did sleep in til 10:30am when I finally had to wake her up so she'd be awake for PT at 11. She was NOT happy to be woken up. I guess that saying is true...never wake a sleeping baby...or is it, let sleeping dogs lie...either way. She got over it and actually ended up in a fairly good mood for PT. That's all we had today, no need to leave the house, and that was a good thing because my helper called in sick. Grocery shopping and house cleaning will have to wait til tomorrow. Reagan was still VERY spitty today. Like a faucet really. She's not great at managing it either. It either pours out of her mouth or she chokes on it. I don't know if it's related to the vital stim her therapist tried with her yesterday or not. Reagan really turned on the giggles this afternoon. Lots of laughing. Nonstop laughing. And some squealing too, which really catches me off guard. All of a sudden she'll let out this super high pitched scream. She was a handful during Bible study tonight. It was nearly impossible to keep her quiet. Anything you say to her makes her laugh even more. She's a silly one. Now the funny has worn off and she's just plain cranky. Hopefully I can get her to fall asleep soon. She should be tired right??? True to fashion Reagan did not want to go to sleep last night. I put her in her bed but she was wide awake when I fell asleep. Eventually she did fall asleep but woke again around 4am. I woke up because I thought I heard something on the monitor, looked at it and there she was turning her head back and forth, back and forth. Again she eventually fell back asleep but woke again around 7:45am. That's early, especially considering she was up part of the night. She was very gurgly and spitty...that had to have something to do with her not sleeping as well. It almost sounds like a nasal sort of congestion but her nose is completely clear. Not runny, not clogged...I can't figure out what exactly is going on. Please keep her in your prayers...we just got over strep and an ear infection, we need her well for a while again. She threw up this morning and we almost canceled her feeding therapy but afterward she seemed OK. There didn't seem to be any nausea, I think she just choked and threw up whatever was in her throat. We headed off to feeding therapy where she did surprisingly pretty well. Her therapist tried something called vital stim on her. She's been wanting to try it with Reagan for quite a while but I was always a little unsure of it. It's supposed to help her swallow. Not so sure if it did anything except make her super extra spitty this afternoon. She gave her a veggie stick and I was pretty impressed to see Reagan actually crunch down on it (several times)! She hasn't had anything like that in months. Then we came home and had an ECI therapy appt. She was super cute and smiley this afternoon. Very sweet, even when she was being forced to work. When I lay Reagan in bed at night she typically isn't the least bit sleepy (and that's usually sometime between 11-12 at night). She lays there looking at the scenes projected on the ceiling by her SoundSpa or turning her head back and forth, back and forth for what seems like eternity. But eventually she does fall asleep. And lately she's been sleeping in a little, which is a big bonus. I still have to get up and begin her morning medicine regimen (which I can start with her sleeping since she's tube fed), but at least I'm not having to get up too early. Sleep is good. And she's been doing more of it during the day lately. Not sure what that's about because for a while now she's been going on zero naps. Hopefully she's not feeling under the weather. Speaking of, still nasty gloomy rainy weather here. While I appreciate the cooler temps, I could do without the rain and overcast skies. 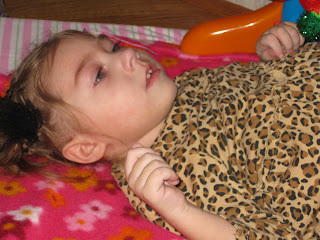 Reagan slept through vision therapy today but woke up when the dog barked at the PT ringing the door bell. She wasn't too happy at first, but got over it pretty quickly. We even put her in her stander for the first time in over a year! We had to adjust it because she has definitely gotten taller, but she did well. She didn't seem to mind it much and did a good job holding her head up (most of the time). We're going to try to make a point of putting her in it at least once a day. Hopefully she'll be able to regain some strength in those skinny little legs. Reagan woke up happy this morning albeit a little groggy. She was flopsy-mopsy but in good spirits otherwise, so we decided to give it a go with feeding therapy. We weren't there but a few seconds and she started dozing off. The eyes were just not staying open. She was smiling but with eyes closed. A few minutes later, she was out cold. Her therapist was able to get some good stretching in but not much else. She tried a few drops of applesauce before she passed out. Some of it came out, some stayed in. On a good note, she didn't seem gaggy with anything really, so that was good. We were going to give it a try with OT, but she was just too sleepy to do anything. Of course as soon as we loaded her into the car, the eyes opened and she was awake again. It was a gloomy day outside, cold and rainy, I can't blame her for being sleepy. I was sleepy myself. Wish I had gotten a nap. I leave you a picture of my big girl. I think she looks too cute in her velvet jogging suit.